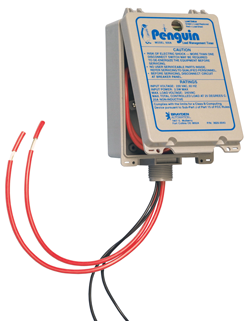 The Penguin Load Timer is an electronic time control unit designed for use with utility load management or time-of-use programs. It attaches directly to the customer's controllable load. Set the timer at the utility's site with the easy-to-use Windows-based Penguin software (provided). It can be set for as many as four control cycles a day, with different schedules for summer and winter, weekdays and weekends. Once programmed, it will operate perpetually. Everything's automatic- no need to reset the schedule from year to year. The timer consists of a micro controller, a real-time clock module, support circuitry, an RS-232 interface, and a 35-amp power relay. The Penguin Load Management Timer is the quickest, easiest, most effective way to control loads during peak demand hours. You'll love the low cost, easy installation, and immediate on-peak load reductions! The Penguin Timer has been used in a number of applications for Time-Of-Use control. Utilizes advanced temperature sensing technology to measure accurate air temperature without being affected by wind, rain, momentary cloudiness or reflected solar radiation off the ground or from surrounding objects. Time and temperature can be used independently or in combination to determine the desired on-peak condition. Enclosure Dimensions: Approximately 6" x 4" x 2.25"
Shipping Weight: Approximately 1 lb. A water heater doesn't have to run 24 hours a day!